The burpee always begins from a standing position; hips and knees extended, chest tall. From this position the athlete moves themselves to the floor. This can either be achieved with a jump or step back, however the movement does not necessitate the athlete performs a push up, they can simply lower themselves. When on the floor the athlete must have both chest and thighs in contact with the ground. From the floor the athlete returns to a standing position, either by jumping or stepping the legs up, and then performs a small vertical jump while simultaneously “clapping”, ie: touching their fingers behind their head. The “clap” must be behind the head and not in front of the body; this is to ensure full extension of the torso during the jump. The burpee is a great conditioning tool. Everybody can perform it and it uses the athletes own body weight to test them. It helps to build upper body strength and good cardiovascular conditioning. It can also be used as a punishment for turning up to class late or using negative language like “I can’t”. This is a movement that you will see all the time in both warm ups and the main wod. They can range from sets of 10 to 50 or 100 so it is important you chose your style of burpee carefully (ie: jump back vs step back). 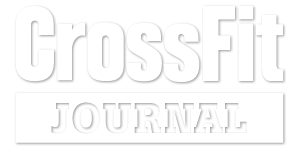 They are one of the foundational movements in CrossFit, used frequently in class, qualifiers and competitions. The down up is a burpee with no jump and clap at the top, just full extension of the hips and knees. There are also bar over burpees (lateral and bar facing), burpee box jumps, burpee pull-ups, muscle ups and toes to bar. These versions do not include the clap as the connected movement replaces it.